Thank you for visiting CastelliHomes.com. Although we’re one of the 500 largest brokerage firms in America, we’re still driven by the energy of the individual. Our Agents and employees are the best in the business. We believe this with every breath we take. 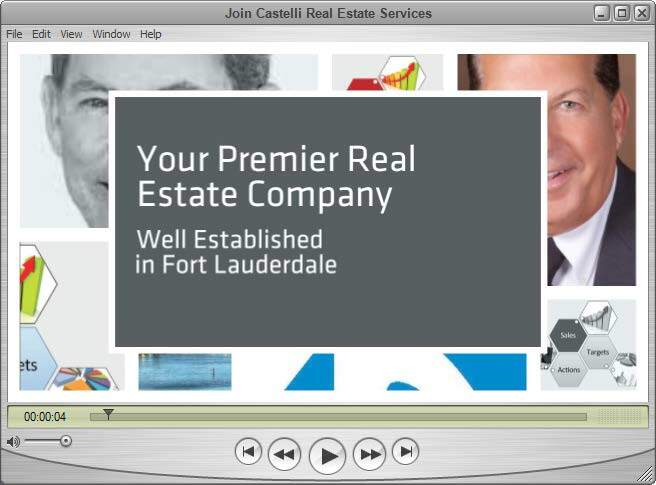 We invite you to visit with us to learn more about career opportunities with Castelli Real Estate Services, a member of Leading Real Estate Companies of the World. Our family of Agents combines the energies of outstanding people with Leading Real Estate Companies of the World, the world leader in total sales volume. Every asset necessary for your success is right here at Castelli Real Estate. And all with No franchise fees, no marketing fees, no desk fees. Instead we’re about a total commitment from our leaders and staff to your success. Call or email us today for a confidential interview. Whether newly licensed or investigating a change from your current Broker. The contact is confidential. What LeadingRE can do for you and your clients! LeadingRE is a global network comprised of over 565 premier real estate firms in over 65 countries. With 1.1 million in transactions and over $368 billion in home sales, more than any other real estate organization in the world. This allows our agents to help with their customers needs across the country and around the globe all while getting paid for it. Industry Leading Monthly Real Estate business classes taught by successful professionals which can be taken as many times as you like and are free to all our associates. We have an extensive library of training videos for all aspects of the real estate industry from internet marketing, client retention, business planning, winning listings and so much more! Click here to find out what Castelli Real Estate can offer to grow your business! With long standing affiliations to multiple REALTOR ® associations, co-owner John Castelli, alongside Steve David, hold themselves and their agents to a higher standard of service. We proudly display the code of ethics on our website and in our interactions with clients from all walks of life. Both John Castelli and Steve David are Past Presidents of the Fort Lauderdale Board of Realtors and are currently members of the Board of Directors, Florida Realtors, & Greater Fort Lauderdale Charitable Foundation. John Castelli is a member of the Broward Partnership for the Homeless board of Directors. Our company is a village of real estate professionals who work in a harmonious atmosphere to further enhance their ability to succeed in our industry. If you don’t look forward to coming to the office…change offices! We are committed to hiring motivated and hardworking people and offer the most enjoyable real estate experience for both our customers and agents. Our mutual success is a commitment we take seriously and drives our business. To learn more about our family and speak to one of our friendly Brokers please contact: John Castelli 954-661-2334 or our Sales Manager, Rod Blacklock 954-593-9035.